The ongoing debt crisis in the US and Europe may force China to move faster on renminbi appreciation to mitigate the fallout on the domestic economy, experts say. “Taming inflation is the top priority for the government and a faster appreciation of renminbi will help rein in the price of imports and limit their spillover impact on domestic prices, particularly if global commodity prices spike further,” said Ding Yuanzhu, deputy head of the Policy Advisory Department at the Chinese Academy of Governance. Such actions are deemed necessary especially as the recent consumer price index numbers, a major gauge of inflation, are signaling the chances of a hard landing for the economy. Ding said that with the US likely to launch a third round of quantitative easing in an attempt to stimulate its economy, it is time to realize that the two earlier US attempts had led to spiraling commodity prices and huge inflows of hot money into China, and further increased inflationary pressures. The weakening of the US dollar has also not helped matters. 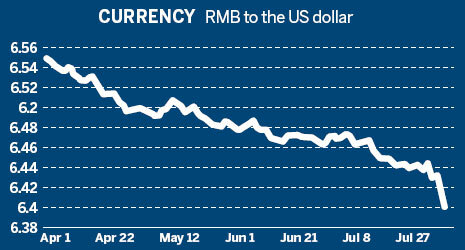 The greenback dropped to a record low against the renminbi on Aug 10, forcing the central bank to set the official median trading price of the renminbi at 6.4167 against the US dollar, the highest since Beijing initiated exchange rate reforms in 2005. The sharp increase in labor and imported raw material costs, partly attributable to the relatively lower currency exchange rate between the yuan and the US dollar, is also squeezing the profit margins of small and medium-sized enterprises in particular. “Under such circumstances, the government should make the renminbi stronger and readjust its industrial structure,” Ding said. “Rather than focus on growing the export numbers, policymakers must focus on inflation. International experience shows that high and sustained inflation can damage macroeconomic and social stability,” said Wang Jiacheng, a senior researcher at the Academy of Macroeconomic Research under the National Development and Reform Commission.